Made with eggs, sugar, vegetable oil, cake flour, and green tea powder, this matcha green tea chiffon cake is moist and spongy. Perfect for a light afternoon snack! Making chiffon cake was one of my dreams after I started baking regularly since last year. Thanks to your encouragement! I always thought it was going to be difficult to make a chiffon cake. However, after some lengthy experiments with my Castella recipe with good success, this matcha green tea chiffon cake was a piece of cake. Yes, I just said that. And of course, being a crazy fan of matcha, I had to try Green Tea Chiffon Cake first before trying other flavors! 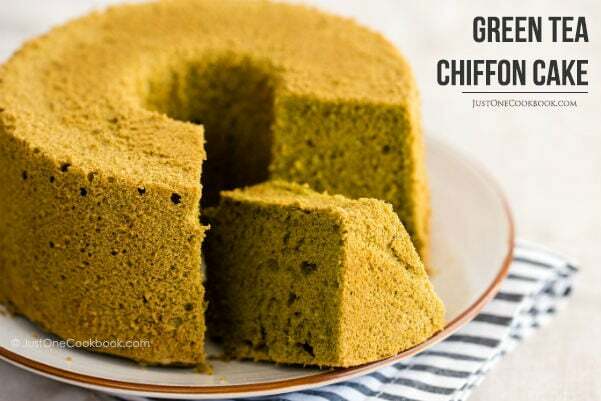 Delicate green tea chiffon cake recipe. 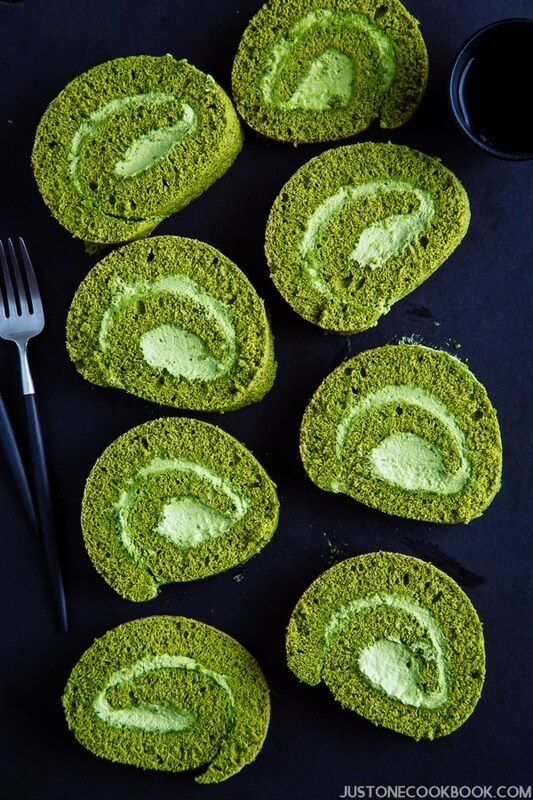 This is a delicious treat for anyone who enjoys matcha flavored desserts. 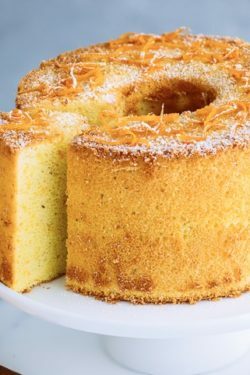 If you are new to chiffon cake, it is a very light sponge cake made with vegetable oil, eggs, sugar, flour, and whatever the flavor you want to add. You beat the egg whites and fold them into the oil-based cake batter so that the cake will get fluffy texture. 1. Make sure you use the correct chiffon cake pan. The best types are the aluminum ones with a removable base (Do not use non-stick bakeware for chiffon cake – it will not work). I bought 17-cm and 20-cm aluminum chiffon cake pans while I was in Japan because I wanted to follow a Japanese chiffon cake recipe . If you are interested in the same pan and know someone in Japan who can receive the package for you, you can purchase one from Rakuten (かっぱ橋浅井商店つなぎ目のない17cmシフォンケーキ型). They are great! Or, you can order this 17-cm aluminum chiffon cake pan or this cute colored chiffon cake pan online from Nihon Ichiban which ships internationally. 2. Do not grease the mold because the cake needs to cling on the sides and center of the pan for support as it rises or it will collapse. 3. When it comes to chiffon cakes, I like them to be simple. No sweet frosting necessary. Good reason to enjoy more than 1 slice. 4. You want to be able to taste the subtle matcha flavor, so I recommend using good quality matcha (green tea powder). You only use 3 tablespoon of oil for this recipe, so you can expect a very light cake. If no one was looking, I would probably ate the entire 17 cm (about 7 inch) cake all by myself! If you follow the recipe closely, you can expect a fluffy, light and moist green tea chiffon cake. It turned out just like the green tea chiffon cake that I’ve tried in Japan and dreamed of making myself. If you are a fan of not-so-sweet desserts, this is for you. Knowing how easy it is to make chiffon cakes now, I am going to try making other flavors soon. What would be your favorite flavor? 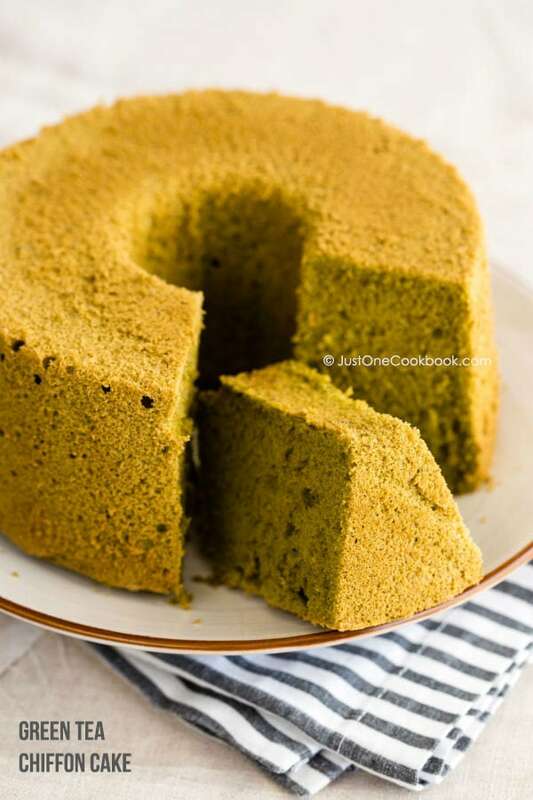 I hope you will enjoy making this Green Tea Chiffon Cake recipe! If you try it, don’t forget to share your picture on Instagram, Facebook, or Twitter with #JustOneCookbook. Thank you so much for reading, and till next time! Gather all the ingredients and a 17cm (7") chiffon cake pan. Preheat oven to 340 ºF (170 ºC). In a large bowl, whisk egg yolks and add 1/3 of the sugar. Then add oil and water and whisk all together till combined. 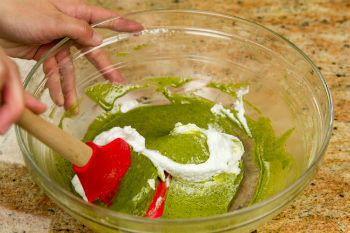 Sift cake flour, matcha, and baking powder together and add to the egg yolk mixture in 3 separate times. Whisk until totally incorporated and make sure there are no lumps. 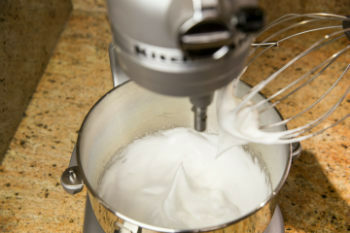 Using a stand mixer, whip the egg whites on medium low speed (speed 4) till opaque and foamy and bubbly. Add 1/3 of the remaining sugar and continue whipping. After 30 seconds or so, increase the stand mixer speed to high (speed 10) and add the remaining sugar slowly in small increments. It takes about 2 minutes (since you changed the speed to speed 10) until stiff peaks form. To check on stiff peaks, pull up your whisk and see if the egg whites go straight up (stiff peak) and just the tip is soft enough that it folds over, like taking a bow. Add 1/3 of the beaten egg whites into the flour mixture using spatula until the mixture is homogeneous. Fold in the rest of the egg whites in 2-3 increments and mix gently but quickly until the mixture is homogeneous. 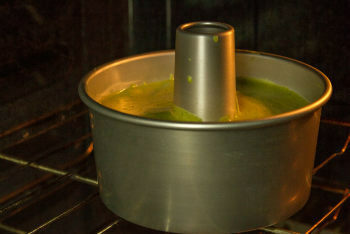 Pour the mixture into the ungreased 17cm (7") chiffon cake pan. Tap the pan a few times on the kitchen countertop to release the air bubbles. The cake must be cooled upside down; stick the pan on a tall heavy bottle, leave until cake is completely cool before removing it from the pan. Use a thin sharp knife or thin offset spatula and run it around the cake. Place the serving plate on top and flip over. The cake will pop out easily. Enjoy! Cake flour: All-purpose flour and cake flour do not perform the same. Cake flour is more delicate, and if you use all-purpose flour instead of cake flour, the texture will be dense and tough. Take one level cup of all-purpose flour, remove 2 Tbsp. Add 2 Tbsp of corn starch back in. Be sure to sift the flour 3-4 times to distribute the corn starch well. Make sure your beaters and mixing bowl are clean and dry. A speck of oil or egg yolk on either one can minimize the volume of the beaten egg whites. Avoid plastic bowls -- even clean ones may hold oily residue that can affect the beating quality of the egg whites. Use a bowl that's wide enough to keep the beaters from being buried in the egg whites. Do not overbeat or underbeat egg whites -- your cake may fall. Egg whites should be stiff but not dry. Make sure you use the correct chiffon cake pan. The best types are the aluminum ones with a removable base (Do not use non-stick bakeware for chiffon cake – it will not work). Do not grease the mold because the cake needs to cling on the sides and center of the pan for support as it rises or it will collapse. Recipe adapted from Chiffon Cake Book by Junko Fukuda. Looks amazing as usual, Nami! I love green tea flavored desserts, so I definitely want to try this one. Your step by step instructions look great! This is GRANT dessert Nami, and I want to try it so much!!! Your video is so cute, I am happy that you start doing it-) Love everything about this post, specially the color of your scrumptious cake!!! Chiffon cake is lovely, Nami, and yours with green tea is just marvelous! I usually make a lemon one. I love the light texture of chiffon cakes. I read a great quote once that chiffon cake is angel food cake that went to finishing school – so true! How lucky to have you as our test kitchen master. Thank you for all your hard work/test. Great illustration/photography! Love Macha and Azuki! I remember the first time I start baking a chiffon cake is green tea flavour… was my chiffon cake success? It was a flopped ugly looking cake!! Chiffon cake is my all time favourite. Congrats Nami on your first success chiffon! yes, you should made the first chiffon with matcha, we love matcha flavour of chiffon too. 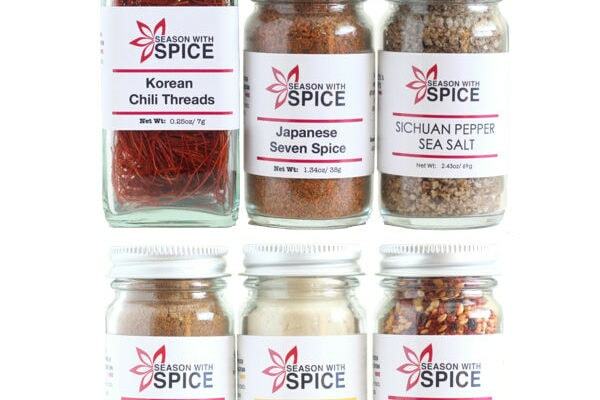 Looking forward more flavours of chiffon from you. This sounds so good. I would also like Pandan flavour but I am having difficulties finding the Pandan leaves here in the Vancouver area. I’ve heard the extract isn’t as good. Hi Patricia can you use Pandan extract just like the vanilla extract it should taste the same I got one at home and bought in my local Filipino store just a suggestion take care. I am so tempted to bake a chiffon cake now. I am drooling over this tall soft cake. Hi Tina! Mango Chiffon sounds good…except for I got allergic all the sudden after I made my Mango Lassi Popsicles! I need to stay away from mango for a while (so sad! )… but thanks for the suggestion! Maybe one day when I can eat mango again! Hi Nami – your chiffon cake out perfectly! You know I love chiffon cakes and they really are surprisingly easy to make and so delicious without a ton of fat. I love them. Green tea flavor sounds divine! Hi again Nami – I recently made a lemon chiffon and thinking green tea needs to be next. I was looking at this recipe and if you see this, can you confirm that you only need that small amount of flour (looks like just 6-7 tbsp)? Not questioning you at all but it’s just less than I’m used to so double-checking. : ) Thanks and hope you’re having a wonderful summer! So sorry to interrupt your Japan vacation, Nami…but thank you for confirming! I knew it would be accurate but doesn’t hurt to ask. I do need to figure out about the cake pan because I notice yours is not only smaller but nice and tall. : ) Thanks again! I don’t know why there is no chiffon cake pan in the US where chiffon cake was originally created? I always wondered why. Not so sweet sponge cakes are just what I want – I spend a substantial period of my time in Japanese restaurants hogging these, lol! I love these, and green tea is my all time fav. Definitely trying this. Hi Nami! I have a 10″ chiffon tray. Can I double your recipe to fit this tray? I always enjoy reading your recipes. Keep it going! You’re becoming a pro at baking! This looks wonderful – love the idea of the green tea flavor. Good stuff – thanks. U r truly a green tea fans! I love green tea too. But I prefer rich and dense cake like pound cake. Btw, your chiffon cake is so success, air holes is so tiny! I would never have thought u never made chiffon cake before… looks fantastic! You are turning into pro Nami…I wish mine comes out so perfect! I love the recipe and you just hit my favorite flavor, maybe drizzle of honey or chocolate over the slice! mmm…yum!!!! btw great video too! Matcha chiffon cake? Yes!! Do you think a black sesame chiffon cake is possible? That would be my second choice for a chiffon cake. Yum! It looks great Nami, I am not a fan of chiffon cakes, but I would try this one! Thank you for sharing. Your video takes the mystery out of the chiffon. I am going to try this! I will try this recipe soon – it’s slightly different to the one I use! Looking forward to your other flavour chiffons 🙂 My fav ones include black sesame and orange! hi Nami, You’ve been bitten by the baking bug, looks like!! That cake looks just so delumptious. I wouldn’t have thought a green cake could look so inviting, but I want some NOW!! This chiffon cake looks beautiful Nami! Love green tea and perfect choice for your first chiffon cake! Looks so moist and I can imagine how amazing this tastes 🙂 Pinned! Your Green Tea Chiffon Cake is gorgeous! You did a great job. I like that you only used 3 eggs for this recipe. My younger son likes recipes that use green tea. I will share this with him. Even better, I’ll bake this for them soon. Thanks for sharing and keep on baking, Nami! The cake looks lovely and the green tea flavor is really unique. Thanks for the tutorial. Wow, your chiffon looks perfect Nami. Of course, I did not expect something different from you, you had to use green tea, great…!!! I love this type of cake. So light and fluffy, I have not bake one these in years! I might have to get out my pan and try it again. Fingers cross I can still do it! A divine looking cake! So light and fluffy. Gorgeous cake, Nami! Absolutely a must-make! And in response to the Dove campaign – I looooove Dove and everything that it stands for. I LOVED this recipe. I will try this out soon. 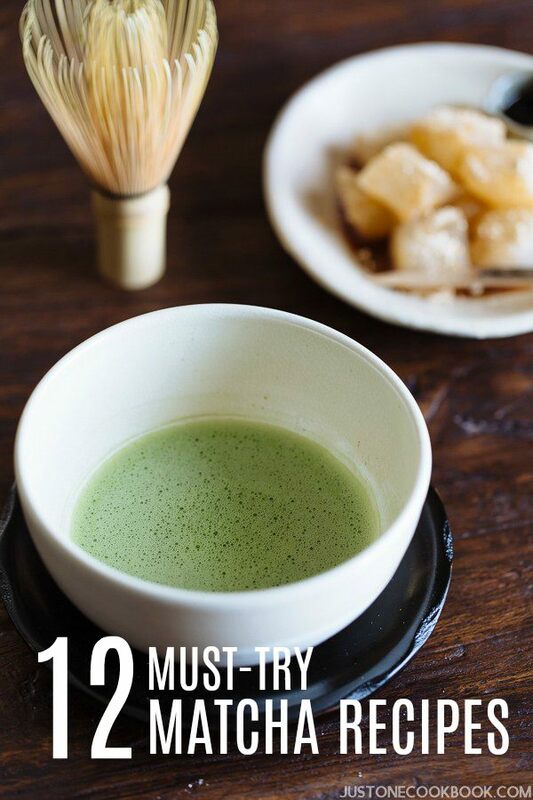 Never tried matcha and would love to try it out. I am so impressed by your step by step photos and the attention to details. Hats off to you dear Nami! Nami, this cake looks so beautiful, fluffy and perfect. I really enjoy green tea flavored desserts and this is one of the things I will get to soon. I have been enjoying your you tube videos, very well done my dear. Keep it coming. Looks gorgeous Nami, I’m so happy you started baking more. All of you treats look and taste delectable. Wow Nami, your cake turned out perfect! The texture looks great congrats on your baking dream come true :). I do love the green tea color too very beautiful. I can see how tender and velvety this cake is… amazing job! I could this whole cake!! Love the fluffiness. 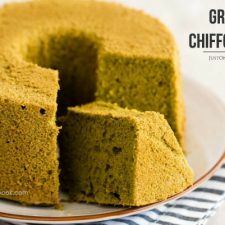 What a great idea to use matcha in a chiffon cake! Very clever my dear! You cake does look very moist and delicious. I’ve never made a chiffon cake and you’re right – it doesn’t look that hard, but then that might just be all of your wonderful pictures and tutorial! Thanks for the inspiration Nami! Your chiffon cake looks so light and delicious, Nami! I can’t wait to see what flavor you’ll try next. Love your video too! That sounds wonderful, I really enjoy the delicate flavor of green tea in desserts. Hi Nami, I love your green tea chiffon. Saving this recipe for my next chiffon cake. Will double the recipe as my tray is 21cm. I am crazy for matcha (as you know), I hate oversweet desserts so this is definitely my kind of cake! It looks perfectly light and fluffy which is not obvious with sponge cakes. Nami, that’s so pretty! I’ve never eaten a green tea cake before but I want to! Um be my fairy godmother please? Well congrats on your first and very successful chiffon cake. And I totally approve of the flavor. Ah the magic of beating egg whites! I love this! I am not a huge fan of desserts and on most cakes I find that the frosting takes over and you lose most of the cake. I would not have that problem with this cake and it looks so light and fluffy! Hi Nami, Love the cake and the clicks! Never tried chiffon cake, but yours look truly delicious. I used to eat these chiffon cakes when I was a kid., especially with these creamy “whipped cream” fillings. The recipe is going to be a tough one to veganize, but that is something I would love to try one day! Have a great weekend! Nami, gorgeous cake! Love the color and all the detailed step-by-step instructions and photos! 1. The egg yolks look big. Can I know the weight of one egg? The eggs I have here weight about 60 – 65gm per piece. I think that’s very small?? 2. Can I substitute green tea powder with Milo powder or chocolate powder? What should I take note when choosing other substitutes? 3. Can I bake this in a cup because my chiffon cake tray is not as tall ? Hi Felicia! Please find my answers below. 1. I’ve never majored eggs in gram (sorry!). According to Wiki (http://en.wikipedia.org/wiki/Chicken_egg_sizes), large egg is 57 gram. 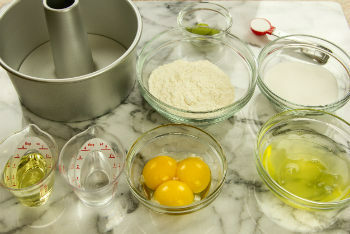 And according to this site (http://www.pastryscoop.com/category/look-it-up/eggs/), the large egg is 55 gram. 2. I think it will work as long as the weight is same. Volume can be different. 3. Hmm.. good question. I think as long as the cup is not big, it should work. If it’s large, it takes more time to cook in the middle, but as long as it’s decent size… but can you flip upside down after being baked? Also I recommend aluminum texture or paper for the baking pan to get the best result. Nami, this is my favourite cake of all times, I grew up on them! Not the green tea but we have pandan leave flavoured ones ( still green in colour), and in fact I just made lemon chiffon last night! I love the video you made, gosh so many hard work you put in! This looks so light and fluffy! You’re becoming an expert baker Nami! My New Year’s resolution to bake more often has gone by the wayside. But your matcha-filled baked goods are serving as good inspiration for me! Oh my! This Green Tea Chiffon cake looks really soft. It’s perfect with a cup of coffee. I love sound of a chiffon cake! It sounds so elegant and yummy, of course! Love the green tea too! Damn, i love the biier sweet taste of matcha cake…. LOVE chiffon cake and the use of matcha here. Yummy!! Wow that cake looks perfectly baked! This is what I am saying, you will be an excellent baker soon. Want to see more of your Japanese cakes. Green tea chiffon cake… now thats what you call Yum!!!!! Thanks Nami for this simple, quick and easy Green Tea Chiffon cake. I love this cake so much. Look forward for more chiffon cake recipe. Nami, I just replenished my stock of matcha the other day at my favorite tea merchant in town and while I was there they shared a recipe for a green tea cheesecake with me. But I think I would much rather try this green tea chiffon cake, as I am a very serious chiffon cake lover! Hope life is treating you kindly, dear friend! Have a fabulous week! That cake looks so light and delicious and I love the delicate colour, Nami. Happy to find a not-too-sweet dessert to have with my afternoon cuppa. I really need to find my chiffon cake tin and make this! You know how much I love matcha and how much I will love this 🙂 Thanks for the recipe! What a gorgeous cake! Love the flavors! Cake flour is a low gluten flour while self-rising flour is just all-purpose flour with baking powder (leavener) already mixed in the flour. You can make cake flour too. To make 1 cup cake flour, put 2 Tbsp. cornstarch in an empty 1-cup measure. Then add all-purpose flour till the top. Sift the mixture 2-3 times to evenly distribute the cornstarch. I did end up making the cake but it turned out more of a sponge with subtle green colouring than the nice green moist cake you made. No idea what went wrong, but I have pictures. Hi Nami, I have a question regarding the amount of sugar that you list in the recipe, it seems like 75 g (3 oz, or 2/3 cup and take away 1 tsp.) sugar doesn’t make sense to me. I weighted with 2/3 cup gave a 144 g or 5 oz of sugar not 75 g or 3 oz like you stated it… anyway, I baked the cake… it turned out great and waaayyyy too sweet for our taste… please confirm if I am wrong or not… hope to make it again with your help. Thanks!!! Frances, thank you so much for your comment. I know this cake is NOT so sweet, so I knew something was wrong. I just checked my notebook and it says 85 g (3 oz, 1/2 cup – 1 Tbsp.)!! SO sorry!!! I think I got messed up with the flour amount (75 g and 2/3 cup… from there). My note is correct because I always use my note to make this recipe. Thank you so much for spotting the error. Did you add 144 gram? >_< Ahhh! 85 g should be perfect. I'm very sorry Frances! Hi Nami, I have come to “eat” your lovely chiffon cake, looks so soft and fluffy, am going to pin this for future reference:) Love the video! GREAT MAKING THIS FOR SCHOOL!!!! Thanks for sharing this recipe. I have tried to make it but i substituted matcha with cocoa powder, and they are just as tasty. The only problem is…. I seem to always have too much dry ingredients left ( i try to put them into the egg yolk mix a little at a time), and before I could finish pouring all the dry ingredients, the egg yolk mixture is already way too thick. does the amount of flour actually matters to how it turns out? Dear Nami, I tried this recipe into cupcakes liners but unfortunately they just collapsed in the middle. Do you have any suggestion? Thank you for share your lovely recipes. Hi Karla! I’m not an expert in baking but there are two things you need to think about to make chiffon cake. 1) The batter needs to be able to climb up the sides of the pan. That’s why we don’t grease the pan. Is it possible to use the muffin pan instead? Non stick material is better for chiffon cake. 2) The upside-down cooling method is necessary to prevent the cake from falling. How did you make the cupcakes upside down? As I mentioned in 1, maybe muffin pan might work? Thanks for your reply, Nami! I´ll try muffin pan, as you suggest. And I´m sorry, but I didn´t follow this important step of cooling them upside down… They didn´t have that delicious crack on top as yours, but they were round on top. After a couple of minutes they crashed, rsrs… Thank you again!! Thanks for your fabulous recipe. I tried many chiffon cake’s recipes before, however, not as good as yours. The cake is moist and fluffy. And I can easily take out the cake from the pan and maintain a good shape. Thanks for your sharing. By the way, is Chiffon cake origin from Japan? Thanks for the recipe! Just made it this morning and it turned out amazingly moist and fluffy. I dropped in a little honey to the wet ingredients before adding the dry ingredients because I wanted just a hint of honey. I also really appreciate that you use grams rather than cups. Thanks again! Hi Vee! Thank you for trying my recipe! So happy to hear you enjoyed it. Love the addition of honey! I really think all recipes should be written in gram, especially baking. A small difference can make a huge difference in result. 🙂 Thank you again! Look forward to trying more of dishes from your blog. I am so glad I chose your recipe to make my FIRST chiffon cake. It turned out just as you said－ light and fluffy! I could really understand why you would want to eat the whole thing by yourself, because I felt the same way, too, when I tasted it. Thank you so much for this recipe! Hi Nami, I love matcha/green tea and am so glad to have found your recipe! What would be the best way to store this chiffon cake if I plan to serve it a day after making it? I’ve seen some chiffon cake recipes using an additional egg white over yolk.. would that make a difference to the outcome of the cake? Oh gosh, I felt in love in your blog *^* I discovered the chiffon cake thanks to my travel in Japan and I missed that cake, thank you so much ! And I have a question, can I translate this recipe in french for my own blog? I want to share that beautiful cake ! If it’s just this green tea chiffon cake recipe, then I’m fine with your request. PLEASE credit back to my original post (this page) and attribute “curtsey of Just One Cookbook.com”. You can use ONE of my images. Usually if someone uses my image, I do not allow them to copy my recipe and I would request them to link back to my post for the recipe; however I consider this is as an exception due to the translation. It will be great if you don’t because it’s my photography and it has my copyright. Please keep the copyright and watermark on the image when you use it. So someone who’s interested in knows that this picture belongs to me and can contact me. 1) Probably double is okay, as adding 1/3 is a bit tricky? If you can calculate and make 1/3 portion nicely then probably that’s the most accurate recipe to fit in your 26cm (I’d be happy to have this one big green tea chiffon cake!). Hi Nami, thanks a lot for your reply! at the end I have decided to try adding 1/3, but it didn’t really work ’cause the cake was very low, but the taste and the softness were ok! !So I need to try again, and next time I’ll double the dose!!! Hey! Hello! I’ve just tried your recipe, which is really good, except that I utilised an organic sunflower oil which tasted a lot, (too much actually) and I was wondering what type of oil you recommend normally. I’m gonna try again tomorrow, because I couldn’t eat it, the oil dominated all the others flavours. PS: I used rice flour, cause I don’t eat gluten, and the texture was just PERFECT! Hi Tatiana! For baking, try to use no fragrant oil such as vegetable oil or canola oil. 🙂 So happy to hear rice flour works. Thank you for letting me know. I’m sure a lot of people will appreciate GF option! I wanted to try this recipe but can not find this size pan. Your recommended store is in Japanese and I can’t read it. Would Mitsuwa have this? Or can I make into cupcakes? Thanks for your recipes and advice. 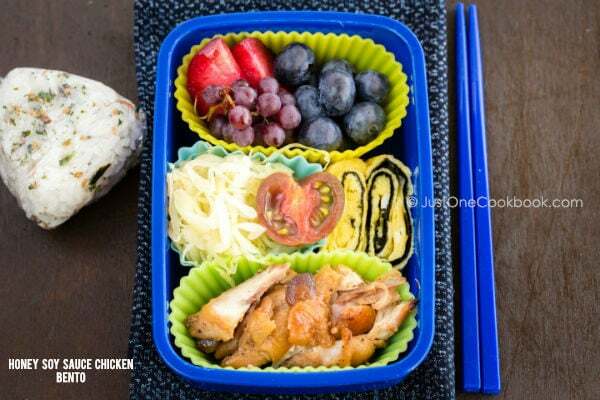 Can I use muffin or cupcakes liners instead of chiffon cake pan? Do you think it will still work? Firstly I do not have a chiffon cake pan. Secondly my girls love all things cupcakes. 1. Must use muffin tin without liners (the batter requires support, and direct baking permits inversion while cooling). 2. Under-fill cups (2/3 full seemed to work for me and I had about one cup of extra batter after filling one 12-muffin tin). This is so your cupcakes don’t rise in a way where you can’t invert the tin. 3. Figure out how you’re going to invert the tin ahead of time (will depend on your equipment and how high your cupcakes bake–under-filling means you won’t squash the tops by inverting on a regular rack). 4. I baked at a slightly higher temperature (~350) for about twelve minutes. They came out of the non-stick muffin pan well after cooling. Great way to enjoy this recipe without keeping the oven on for long during the summer! Thank you so much for your detailed and helpful information!!! You’re AWESOME!!! THANK YOU!!!! Wow this cake looks delicious! I love green tea cake, but, sadly, only get it once a year on my birthday so I wanted to make it myself. I had a quick question though: Can I substitute regular all-purpose flour for cake flour and still get a good chiffon cake? If so, what amount of all-purpose flour should I substitute in? Thanks! My green tea-chiffon-cake did not turn out. The dough was 1/ half the size. It was sticky and very minimal. I followed the receipe exactly. Please advise. Hi Thelma! I’m so sorry to hear your Green Tea Chiffon Cake didn’t come out well. It’s very hard for me to tell what went wrong for baking because I wasn’t there to watch each process and differences in ingredients, accurate measurement, a lot of things matter in result, unlike savory dishes. What kind of chiffon cake pan did you use? When you pour into the cake pan (step 9) was your batter look like that smooth? Or already sticky? After adding meringue, it should be “fluffy” and not sticky. I think somewhere along the way, something went wrong. I just don’t know what exactly from your description of the problem… I can help analyze if you can give me more detailed info. My husband is making this recipe and we got confused with your sugar amounts. You said “85 g (3 oz, or ½ cup and take away 1 Tbsp.) sugar” and when he measured the 1/2 cup minus 1Tbsp that is more than the 85 g or 3 oz you said for the first 2 options. Just wondering if it’s a typo but we did decide to just go with the smaller amount of sugar. I’m excited to eat it!! Hi Yanna! You left comment about one hour ago, so I assume you’re done baking? How did it go? For the best result, chiffon cake pan is an ideal and non-stick surface is not good for chiffon cake. Also, I recommend the weight measurement instead of cups. Hope the video was helpful to see the batter consistency. You’re website is really nice. Thank you. Just something I’ve noticed experimenting on green tea cakes.. If you mix the flours and use rice flour and coconut oil the texture end up really well. Dear Nami, first of all many compliments for your websites! I have just made the green tea chiffon cake following your very precise instructions and it came out perfect! I kindly ask you to give me some suggestion on other possible flavours. Thank you very much in advance! Next I will try Kasutera cake, it seems delicious! I’m a big fan of your website and recipes! 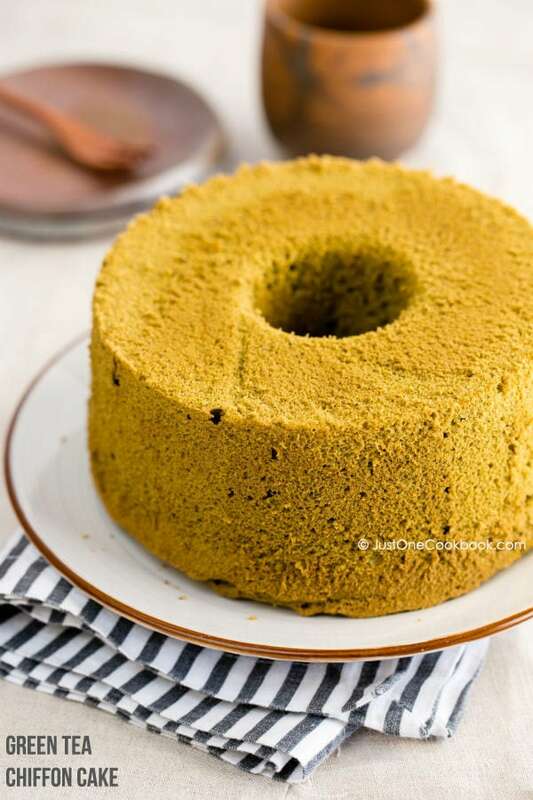 How would you adjust this Green Tea Chiffon Cake recipe for a 10 inch Chiffon Cake Pan? I just tried using six eggs and 150 g cake flour, while keeping everything else the same, and baking for about 50 minutes. It didn’t come out as well as following your recipe exactly last time using a 7 inch pan. Also, after whipping the egg whites,can I use the same bowl in the stand mixer to mix the egg yolks with the other ingredients? Hi Lei Lei! Thank you so much for reading my blog and trying out my recipes! I’m afraid to give you adjustment as I’ve never tried using another size cake pan, especially when it’s not simple double or 1/2 amount… I need to test it out to see how it works, especially with different size pan. You MUST fold the meringue into the batter. Don’t mix it. You need to keep the air in the meringue and not break it. Otherwise the chiffon cake will not rise. 🙂 Hope this helps. Happy New Year! Unfortunately I don’t have a chiffon cake pan, so I tried it baking it in a normal one – although it wasn’t even half as beautiful as yours, the taste turned out really well, and my family was complimenting its soft and fluffy texture. As they don’t like the taste of matcha as much as I do, i tried adding a lime icing, which went well with the matcha, I thought. This recipe looks wonderful! Do you know how much vanilla extract I would use to substitute the matcha in this recipe? Will it still turn out well with the vanilla substitute? Hi Morella! Sure but I’d increase on flour a tiny bit as you’re not using matcha. 🙂 Hope you enjoy! What do u mean by take away 1 tbs sugar from 85 gr sugar? A lot of Americans prefer recipes with cups (not grams), so I have to measure precisely buy using cups and Tbsp/tsp… So if you’re using a measuring cup, you need 1/2 cup of sugar but have to take away 1 Tbsp, which is close to 85 grams. After making your green tea chiffon cake a few times, once, I decided to try something different, so I replace water with orange juice (omit the matcha powder as well), and it turned out GREAT! I forgot if I zested the orange before I juiced it but it was defintely a orange chiffon cake at the end! I made it the 2nd time just recently, I used Tropicana oj w/ pulp, and it came out just the same as my 1st try (thus why I can’t remember if I used the zest the 1st time or not). Nice orange colour and I think it came out fluffier and more moist than green tea chiffon cake. Hi Jane! Thanks so much for sharing your tip to make Orange Chiffon Cake! Sounds awesome!!!! My kids will love it! Once my kitchen remodel is over, I’d love to give it a try! Thank you!! Can I use brown sugar or does it have to be granulated sugar? Please advise. Thank you. Nami, thank you for sharing the wonderful receipe. Can i used top flour instead of plain flour. What is the weight of the egg you using? Been meaning to find a recipe that uses a matcha cooking powder I bought online a while ago. Tried your recipe and it was a huge success! Admit I used a little bit more sugar but still cake not too sweet, super spongy, light and you can really taste the tea flavour! I was skeptical because it only called for 1 tablespoon but it was just right. Thanks very much for the recipe! I’m glad to hear you enjoyed this chiffon cake! 1 Tbsp. matcha is quite a lot (and expensive) but I tend to like more matcha flavor so if you have good quality matcha (that’s not low-grade yellow green and awful bitter taste), it is wonderful with even 1 Tbsp! Thanks so much for your kind feedback, Marina! Can I replace veg oil with olive oil? Eager to try this recipe as I’m a matcha fan! but mine is the dark green matcha powder, bitter taste so should I add in more sugar? If it’s a good quality matcha, then it should have a bright vivid green color. Matcha is bitter, but if it’s low grade matcha, it has unpleasant bitter taste (besides matcha’s bitter taste). Thank you so much for the recipe. I baked the cake and it seems spongey in enough but didn’t rise as high as it appears in the picture. How high does your chiffon rise to? Any tips? Hi Lily! Did you use a non-stick chiffon cake pan? The cake needs to climb up, so that’s first thing I wanted to ask. Then secondly, I would probably ask how was your meringue – that’s the key for tall chiffon cake as you need nice air. If you didn’t make good meringue, the bubble will collapse and the cake will be flatter. Thanks for responding. Yes, I bought the pan you put on the link above. Maybe my meringue wasn’t stiff enough then? Well, I’m going to try it again hopefully with better success. Not going to give up until I get a cake as lovely as yours. Thanks for sharing your wonderful recipes with the world. I tried this recipe out last night. The yolk batter was thick n sticky n my cake turned only filled up abt 65% of a 17-cm chiffon pan. It is also not as soft n fluffy but taste wise, it’s good. I would like to try again but just wonder what is the outcome of your subsequent tries n any advice for me? You have recently changed the recipe and increased the flour content. It makes the cake very dry. What was the flour content of the previous version of this recipe? I did not increase the amount of flour. Gram measurement NEVER changed because this recipe works perfectly every time I make. I updated cup measurement as I noticed it wasn’t measured accurately at the first time I wrote this recipe. As I mentioned in my FAQ page (https://www.justonecookbook.com/faqs/), it’s possible that my recipe gets updated. I always use my recipes and make sure my measurement is correct by following my own recipes when I make them. So please note that it’s possible that my recipes changes IF I think it’s necessary. 1. Fluff up the flour several times with a spoon. 2. Using the spoon, sprinkle the flour into your dry-cup measure (the one that measures exactly a cup at the top). 3. Scrape off the excess with a knife. With this approach, 75 g cake flour should be about 2/3 cup. It’s highly possible that 2 Tbsp. difference comes from the way you measure it. I always recommend to use a kitchen scale for exact measurement so every time you make you have the right amount of ingredients, without any mistake. Hello Nami! I tried this recipe today on a small pan and baked it in the toaster oven. It was soooo good! My husband and I wanted to finish the whole thing but had to control ourselves! He loves cake that is not too sweet and with no frosting. The size of this recipe was perfect for both of us too. Although of course it was so good that 2 hours after eating it, I was still thinking of it. So I had to make more that same day! I doubled the recipe and used the small pan and a loaf pan and made sure to invert them after they finished baking. It was soooo good again. My husband can’t wait for me to convert the recipe to a mocha/coffee chiffon cake which is his favorite! I think I’ll make coffee and cool it down and substitute the water with it plus I’ll have to finely grind instant coffee and substitute the green tea powder with it. I have a coffee bean grinder that can grind the beans to a really fine powder. Do you think that would still work as I actually don’t have instant coffee at home. Hi Sunflowii! I’m so happy to hear your chiffon cake came out well! It’s so light and fluffy and perfect sweetness! Another chiffon cake coming this week. 🙂 Good luck with mocha/coffee chiffon cake. I’d love the coffee flavor. I like my Earl Grey Chiffon Cake too… matcha, tea, coffee.. they are all my favorite. 😀 And wow thank you for trying the almond cookies two years in a row! I am so happy that you liked the recipe! thank you for your endless supply of fabulously tasty dishes. i have a question for you. i have tried on two occasions to make your chiffon cake. everything comes out perfectly ( i say so modestly) except when it comes to the colour of the cake. the outer edges of the slice are always greener than the middle area…am i doing something wrong? is the tea i am using no tthe right one? when in Tokyo i did notice that the slice was uniformly green. this morning, however in a japanese restaurant in Paris i noticed the same effect on their slices of matcha cake, but they were unable to tell me why. i am hoping you can clear this point up for me. Hi William! May I know how it looked like when you were done at Step 8? Was the batter homogenous color? I assume it was, that is why you’re not sure why it has different color when it’s done baking. How uneven was it? So it was darker green vs lighter green? My guess is that your oven temp is maybe a little higher than mine (each oven it’s different). I assume you didn’t grease the pan (please don’t), but maybe outer layer of batter might be affected from heat. Do you think that’s possible? After you pour batter, you can also try mixing the batter with a skewer. I think I showed that in my other recipe. Step 14. You can try that to even the batter. Hope this helps… sorry I could only guess. Hi Nami! I’m a student studying abroad so sometimes i really miss Asian cakes so i decided to i make them here 😀 so far i’ve tried making castella cake and this green tea chiffon cake using your recipe but i replaced the green tea powder with cocoa powder. its the best chiffon recipe xD thank you! 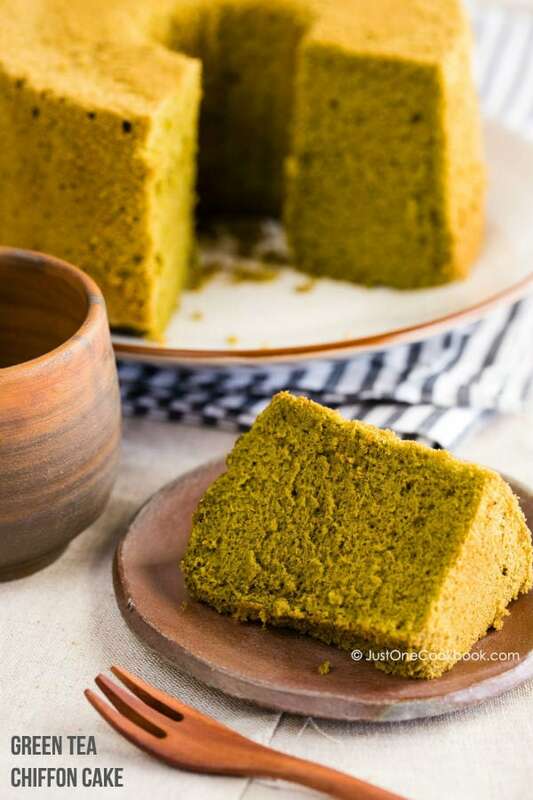 This is my favorite recipe for matcha cake, no butter or cream, so light and yummy!! Thank you for sharing!! This cake has been perfect and delicious every time, thank you for sharing this recipe! I m a new baker n love chiffon cake. Chanced upon your recipe n decided to give this recipe a go as I, too, enjoyed the matcha cake at Yufuin few months ago! 1) the egg yolk batter is v heavy aft mixing with the 75 g of flour n 10 gm of matcha powder. Hence, my cake batter only fill up 65% of the pan. I saw u r able to fill to abt 75%. How did u manage to achieve that? 2) I m baking at 170 degree n my cake top hv big cracks, unlike yours. I placed an oven thermometer in there n my oven’s temperature is accurate. Perhaps I should use 165 next time? Cake is still baking in oven. Will update on outcome! Hi Grace! From what you wrote in (1) and (2), it seems like your meringue wasn’t beaten enough. When there is a big crack, it’s either you under beat or over beat. From (1), it looks like your case was under beaten. What do you think? I don’t think it’s the oven in this case, but maybe it can be due to heat source being close etc. Hope this helps! Thank u so much for your reply as I really want to try your recipe again. I m no good with meringue as I do not know when to stop beating. May b it was under beaten even though I hv beaten it for abt 7 or 8 minutes with a 750 watt mixer. I will try again since I love matcha chiffon. Another question – the yolk batter became very thick n sticky after adding the flour and matcha powder. Is it normal? Thank you n hope to hear from u again. I won’t say the yolk mixture is “sticky” though. But it’s thick and jiggly kind of mixture. 🙂 I’m assuming you get the right texture. 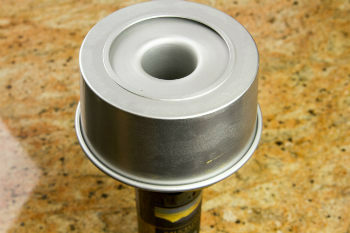 Hi I have a 23cm chiffon cake pan and would like to ask how I can modify the recipe for my pan? Thanks! Hi KumoX! My recipe is for 17 cm and it’s not easy to adjust to 23 cm to make it work with this recipe. I’d double the recipe and fill up, then I’d use other pan for the rest of batter. That way, the recipe is the same. Can I use this recipe with 10″ cake pan? I’m looking to buy the Nordicware 2 piece aluminum angel cake pan but it doesn’t come in 7″ pan unfortunately. Hi, I just discovered your website not long ago and love love love your recipes, They are simple and doable for beginners like me. One question though, how do I replace the matcha flavor to coffee flavor for Chiffon cake. I love green tea product and also love coffee flavored dessert. Hope to learn them both. Thanks!! Though sugar etc I’m not sure how sweet it is… you might need to adjust. But the basic measurement should be good! Thanks, will give it a try later. Last night I made the lemon chiffon cake, and it came out to be so fluffy and soft that my family was amazed. I used regular lemon cuz I don’t have Meyer lemon at home, but still good!! Thanks for the recipe!! Just tried your Green Tea Chiffon Cake and my boyfriend and I are absolutely in love with it! I made it last night! OMG! It tastes wonderful! Thank you so much for sharing the recipe. I never thought I could make such delicacy! I especially appreciate your tips about beating the egg white, getting aluminium chiffon pan, and cooling the cake upside down, as well as making cake flour with all purpose flour! They were so helpful and you made them so easy to understand! I will definitely make this again but I would reduce the sugar by about 10 grams as the cake came out a little too sweet. I really enjoy trying your recipes. They are so easy to follow are the results are amazing. We ended up eating more at home! Yes, please feel free to adjust the recipe. Sugar is important in the recipe, but 10 g should be okay. One more thing. Silly me using the chiffon cake pan for the first time and I put the removable bottom on the outside of the pan instead of inside! I only realized it when the cake was baked and I couldn’t take the cake out! Anyway, this did not affect a single bit of our enjoyment of the cake! Hi if i have a 20cm chiffon pan. How do i adjust the recipe? My husband who loves everything matcha was very pleased with this. This recipe is definitely a keep! Thanks a lot Nami! Hi Floe! You are A W E S O M E!!!! I knew someone is better at calculating. 😀 Thank you so much for sharing!! Happy Holidays to you and your family. Hi, what is the diameter of your cake pan? Hi Olga! Sorry it was hard to find this info – it’s in my Note section of the recipe. My chiffon cake pan is 17-cm (about 7”). So if I want to make my own cake flour, I would take 1 cup of AP then take out 2 Tbsp of it, then add 2 Tbsp corn starch before I weigh it? I need to use 150gram cake flour. Also can corn starch be subbed with other starch such as potato starch or tapioca starch? Would it also work? 1) Correct. It’s American way of making cake flour, which is why the method is in 1 cup…… If you double this recipe (which is why you mentioned 150 g cake flour), you will need ⅔ cup cake flour x 2. 2) corn starch and potato starch can be worked vice versa, but I had never used tapioca starch, so I cannot tell if it works for this recipe. Would I be able to bake this cake in normal pans instead of a chiffon cake pan? I do not own a chiffon cake pan and was planning on splitting the batter into 3 different 7in cake pans instead and just layering them. Hi Kim! The purpose of making chiffon cake is to create this fluffy airy texture for the cake. Using a regular pan don’t quite help creating that texture because the cake batter won’t be able to climb up properly. You will need the tube pan, and do not use non-stick. 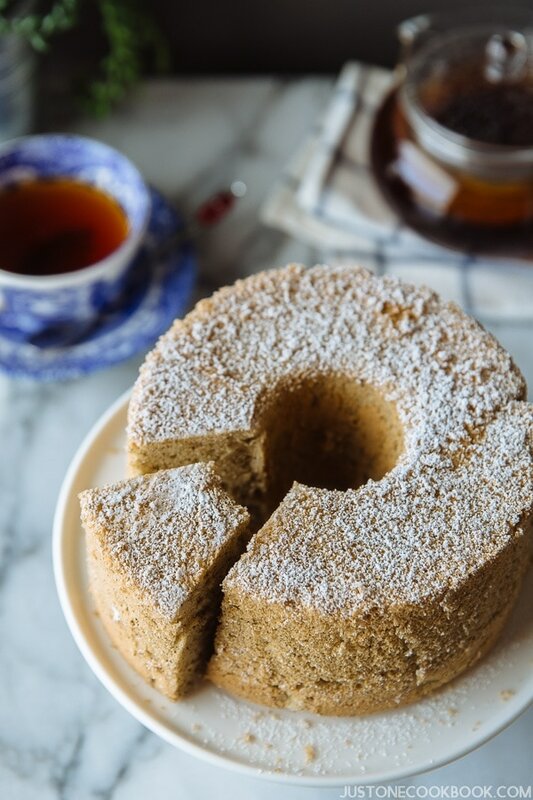 Some readers tried this recipe with regular pan and told me it was successful, but I haven’t tried or looked at the result, so I can’t tell if it was chiffon cake texture or not… I highly recommend buying a cake mold IF you really want to make good chiffon cake. 🙂 Trust me, you’ll be making chiffon cake again and again… so good!!! OMG this is the first time in my life I have made a cake so moist! I added a little cream of tartar to my egg whites but otherwise followed the recipe to the letter. Another great recipe from your website… thank you so much! Thank you Nami-san for another great recipe. I made matcha chiffon cake yesterday for my senpai and she really liked it. She even asked for the recipe. I will forward her the link to your website so that she can try making the cake herself. Thank you very much! Can you please share a chiffon cake recipe for a 20cm pan? Thank you. Hi Ju! Please use the measurement for 20-cm in this post. Just wanted to say thank you for the recipe! I tried it out tonight and it turned out perfect! No tunneling in the cake, rose up perfectly without collapsing, and the green tea flavor is just right! I’ve tried a lot of chiffon cake recipes over the years, but your recipes always give the most consistent result. Thank you! Hi Ann! Thank you so much for your kind feedback, and I’m so happy to hear yours came out perfectly. It made my day! I agree it’s really good to have a recipe that gives a consistent result. It’s one less thing to worry about. 🙂 Thank you again for writing! I followed your recipe step by step to make the cake, however it did not rise too high. I used a 23 cm tube pan like yours , and since is a bigger sized pan , so I double up the ingredients. Hi Mary! Thank you for trying this recipe! If you double this recipe, it’s good for 22 cm pan (https://www.justonecookbook.com/perfect-chiffon-cake/ – see where I talked about different pan sizes). You may want to increase a bit more. Thank you for the useful hints, I will try again. Thank you again for your feedback. I have tried the ingridients for 22cm and I brought a smaller size 17 cm tube pan and both turned out beautiful. You are the best best, have a nice day. I’m so happy to hear that! Thank you so much for your kind feedback, Mary!